Is Your Cell Phone Causing Your Skin to Age Prematurely? This headline may have struck terror in your heart as you quickly tried to guesstimate the amount of hours you have spent peering downward at the blue light emitting screen of your phone, tablet, and laptop. While we all know aging is a part of life, there are steps we can take to preserve our youthful appearances. There are the old tried and true standbys such as drinking at least eight glasses of water per day, laying off the cigarettes and slathering your skin with sunscreen. But the latest news that the glowing light of our modern lifestyles could be aging us, is more than a girl can swallow. But is this a thing? Does the soft glow of your electronic devices cause wrinkles? According to an interview by Allure of New York City dermatologist, Dr. Scott Dunbar, no. There is no need to put away your cell phone and stop taking selfies. "While it's been conclusively shown that visible light can cause some skin diseases like lupus to flare, there's no evidence that visible light, even at high intensity, contributes much to premature skin aging." In terms of the data that's available now, UV light (sunlight) is much more harmful to skin than the light from computers and mobile devices. "Even if there was some data regarding visible light aging the skin, its effect would be minuscule in comparison to ultraviolet light, which has been scientifically and convincingly proven to cause skin aging and skin cancer," he says. "I'd say that you could take over a million selfies or use a computer for 100 years, and that still would not be as impactful as spending a single day in the sun unprotected." Whew. That makes us feel better. However, as with any medical theory, there are those who disagree with Dr. Dunbar. Case in point, Dr. Joshua Zeichner, an assistant professor in the department of dermatology at Mount Sinai Medical Center, says there is evidence that visible light plays a role in aging the skin. "Visible light has been shown to rev up pigment production, leading to dark spots, and promote the breakdown of collagen, which leads to wrinkles. It can also create reactive oxygen species that damage the skin and cause premature skin aging and perhaps skin cancers," says Zeichner. "There's no way to avoid visible light totally, but limiting time in front of your computers and cell phones can certainly help." In our opinion, the key takeaway from this conversation is that it doesn’t really matter which side of the argument you agree with, the bottom line is that we all should be protecting our skin with a broad-spectrum sunscreen. Just be careful about falling for the marketing ploys of companies that are touting special expensive ingredients to protect you from HEV light. 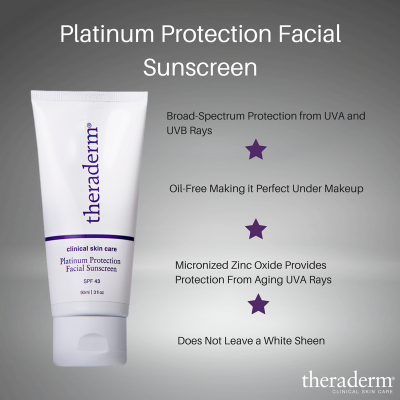 Zinc oxide and titanium dioxide in Theraderm's Platinum Protection Facial Sunscreen provide broad spectrum protection will do the trick just fine!